Garri is perhaps the second-ranking most staple food in Nigeria, ranking closely after rice. Some people would argue that it ranks before rice, while others think otherwise. But, there is no secret about its popularity among the citizen of the country, both the privileged and underprivileged, especially the underprivileged. In fact, due to its status as one of the most common staple food, there was a time its production was once heavily politicked to the point of touting it as a possible export product. However, despite the popularity of garri, the product is highly deficient in almost all food classes except carbohydrate. According to experts, this has led to its association with kwashiorkor in impoverished children whose diets are mostly starchy foods, especially garri. This has also prompted numerous attempts by food scientists in the country and other sub-Saharan countries dependent on the food to try and fortify it with other classes of food, especially foods rich in protein such as groundnut, beans and recently, cowpea. 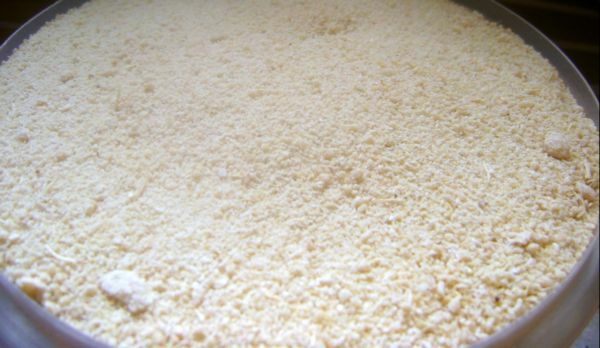 According to Adefuye Yinka, a postgraduate student who worked on fortifying garri with cowpea at the Department of Microbiology, Federal University of Technology, Akure, , this is to achieve higher protein content of the end-product as cowpea is known to be richer in protein than the groundnut and beans. During a seminar on the topic, she laid emphasis on the need to ferment the cowpea alongside the garri, which itself is a fermented product of cassava. She said this was necessary as “this would increase the quality of the food product, since fermented foods are known to be richer in quality than unfermented ones”. Recounting the steps taken to the final product, she said “After soaking overnight in water, removing the testa of the peas and drying, the cowpeas are grounded to powdery form and mixed with freshly grounded cassava tubers in proportions of 10%, 20% and 30%. The mixture is then subjected to the fermentation method usually employed during the normal processing of garri. After roasting, the cowpea-fortified garri was compared to the convectional one, and as expected, the protein content is very high. Generally, the experiment succeeded in achieving what it set out to achieve – producing garri of better quality – in addtion to the overall acceptability due to better taste, texture and aroma. However, potential setbacks to commercialise the product include the high cost of cowpea and the reduction in the shelflife of the soybean-fortified garri.